Welcome to NaviCom, a platform for generating interactive network based molecular portraits using high-throughput datasets. 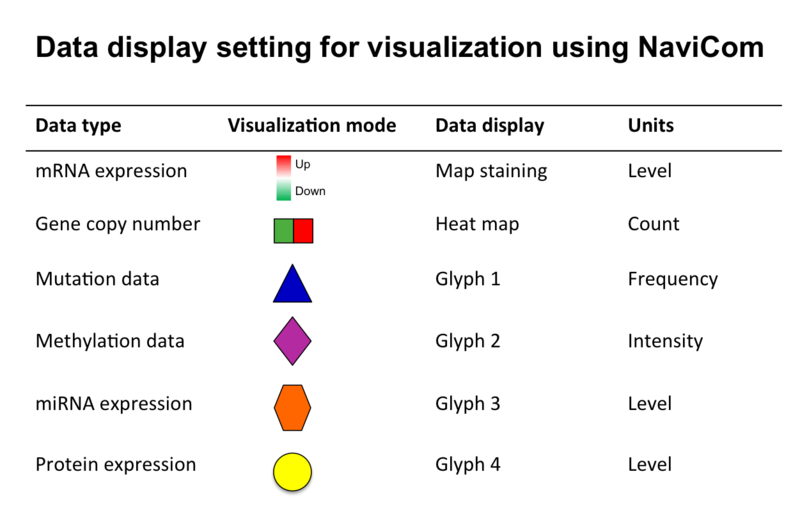 NaviCom connects between cBioPortal database and NaviCell web service and allows to display various high-throughput data types simultaneously on the network maps in one click. Select a study to fetch data, the network map to display the data on, and the type of display. Click ‘Perform data visualization’ to obtain a network-based molecular portrait. For more details, see the tutorial. Note that displaying data on network maps may take several minutes depending on the size of the dataset and the map. Supported browsers : Firefox, Google Chrome, Safari. and perform the visualisation manually. NaviCom was created and is maintained by the team "Computational Systems Biology of Cancer" from Institut Curie.